The traditional use of medicinal plants and its link with pharmacological studies is essential in order to corroborate the effect scientifically. The present work was an experimental study designed to investigate the sedative and anxiolytic effect of the methanol extract of the leaves of Erythrina edulis. The extract was prepared by percolation. Different concentrations: 500, 250 and 125 mg/kg of the extract and diazepam as a controlled drug were administered intraperitoneally to Swiss CD1 mice for both, sedation and anxiety tests. The sleep enhancement test with pentobarbital and the traction test were used for the sedative activity. Results showed that the extract did not possess sedative activity in any of the administered doses. However, the possibility of an opposite effect was observed as an activation of the central nervous system probably. The anxiolytic activity was evaluated by the open field test and the elevated plus maze test, where a behavior with a low level of anxiety was observed. Altogether, the results suggest that the extract has an anxiolytic activity without sedation, which supports traditional use. But, its responses are not dose-dependent, and its mechanism of action is unknown. Besides, toxicity assay was performed in Artemia salina nauplii, resulting in a lethal concentration 50 of 16.570 ug/mL corresponding to zero toxicity. Finally, the phytochemical analysis of the extract revealed the presence of flavonoids (flavonols, flavones and phenolic carboxylic acids), anthrones, anthranols, terpenes (mono and sesquiterpenes), saponins and hydrolysable tannins. Key words: anxiety, citotoxicity, sedation, Erythrina edulis. El uso tradicional de plantas medicinales y su relación con estudios farmacológicos que demuestren su actividad es muy importante. El presente trabajo fue un estudio experimental diseñado para investigar los efectos sedante y ansiolítico del extracto metanólico de las hojas de Erythrina edulis. El extracto fue preparado por percolación. Diferentes concentraciones: 500, 250 y 125 mg/kg y diazepam como droga control fueron administradas por vía intraperitoneal a los ratones Swiss CD1 tanto para los ensayos de sedación como ansiedad. Para la actividad sedante se usaron las pruebas de inducción del sueño con pentobarbital y la de tracción. Los resultados obtenidos demostraron que el extracto no tuvo actividad sedante a las dosis administradas, observándose más bien el efecto contrario, probablemente por activación del sistema nervioso. La actividad ansiolítica fue analizada con las pruebas de campo abierto y laberinto elevado en cruz, observándose un efecto ansiolítico. En conclusión, el extracto tiene potencial ansiolítico sin producir sedación, lo cual soporta el uso tradicional de la planta, sin embargo, este efecto no se presentó dosis dependiente en las dosis utilizadas. Además, el ensayo de toxicidad fue realizado con nauplios de Artemia Salina, obteniéndose una dosis letal 50 de 16.570 ug/mL, lo cual corresponde a toxicidad nula. Finalmente, el screning fitoquímico general demostró la presencia de flavonoides (flavonoles, flavonas and acidos fenólicos carboxílicos,), antronas, antranoles, terpenos (mono y sesquiterpenos), saponinas y taninos hidrolizables. Ecuador is a small country with excellent plant biodiversity being in the list of megadiverse countries around the world. Eryhtrina edulis is a native plant from it that belongs to the Fabaceae family. It is locally known as “cañaro”, and widely used as a source of nutrients and also as a medicine to treat different health problems 1; for example, in the country, the maceration of the leaves has been used for managing nervousness 2. Phytochemical analysis performed on the genus Erythrina have determined the presence of alkaloids, flavonoids, and proteoids 1; and, specifically in E. edulis has been reported the existence of quaternary alkaloids, steroids, and terpenes 3. These different compounds have shown a potential use for anxiety treatment and sedation because of their possible effects on the gamma-aminobutyric acid (GABA) system which is directly associated to these conditions 4,5. So, the phytochemical characteristics of the plant and traditional uses reported in Ecuador by Torres and Ríos suggest that E. edulis could be appropriate for the treatment of nervousness, anxiety, and also has a potential sedative effect. Nevertheless, there are no scientific studies that validate or support the usage of the species and define its specific pharmacological response. Thus, this research is intended to determine the sedative and anxiolytic effects of the methanolic extract of the leaves of E. edulis in Swiss CD1 mice. Plant material: E. edulis leaves were collected in Gualaceo – Chordeleg (Ecuador) at 2332 meters above sea level, (2O54’4.’’S, 78O46’28.3’’W). The plant was taxonomically identified at Azuay University Herbarium, and the voucher was deposited under the number 11980. Preparation of plant extracts for biological activities: the leaves of E. edulis were dried in an oven at 40oC for 24 hours. The material was pulverized and soaked in methanol for 12 hours in order to obtain the methanolic extract by percolation. The obtained extract was concentrated with nitrogen and then lyophilized. The extract was stored under -20 oC in a bio freezer until use. The reconstitution of the material was done in distilled Water-Tween 20 (1%) solution (vehicle) for all in vivo tests. Animals: male Swiss CD1 mice obtained from the bioterium of the National Institute of Investigation in Public Health in Ecuador were used. Mice were maintained under international protocols for the housing and care of laboratory animals. They were under controlled environmental conditions of light (12 hours’ light/dark cycle) and temperature (25°C ± 2°C). Animals had food and water ad libitum. Before performing each test, the animals were fasted for 15 hours and acclimated to the test environment for 30 minutes 6. Mice were randomly assigned in groups of 6 for each test using five groups distributed as follows: negative control group treated with vehicle; positive control group treated with Diazepam (DZ) in a dose of 1mg/kg, and three test groups treated with the methanolic extract of E. edulis leaves at a dose of 500, 250 and 125 mg/kg of weight, respectively. All mice were injected intraperitoneal (i.p.) with the different solutions. All tests were carried out between 8am to 1pm. Every subject was used only once. Pentobarbital-induced sleeping time: each group of animals was given (i.p.) a single dose of vehicle, diazepam or the extracts as described before. Thirty minutes later pentobarbital was administered to all animals to induce sleep in a dose of 40 mg/kg. Mice were put in individual cages for observation by recording them. Latency time and sleeping time were recorded; the first being the time needed for the mice to lose his ability to stand on his four paws and the second being the time needed for the mice to get back on his paws. Traction test - horizontal bar: the apparatus consists of a horizontally arranged metal bar 38 cm long and 2 mm diameter supported by two 49 cm long bars 7, and they were swung in front of the horizontal bar letting them grab the bar by its center point with their front legs releasing their tail by the operator immediately after it. The time needed for the mice to place the rear leg on the bar was recorded. The cut-off time was set to 30 seconds. All mice were previously tested to ensure an excellent locomotor activity; mice that were not able to grab the metallic rod with their hind limbs in 5 seconds or less were discarded. The test was executed at 30, 60 and 90 minutes’ post i.p. Injection to assess the effect of the drug on neuromuscular function over time. Open Field: the apparatus consists of a 50 cm square glass box with 30 cm tall walls and a white grid base. The arena was divided in two segments: the outside one consisted of 16 squares along the walls, and the inner segment had nine squares including the central square marked in red. After 30 minutes of the i.p. treatment mice were individually placed in the center of the apparatus and left in the arena for 5 minutes. Total number of crossed lines, the total number of rearing, total time spent in the center and the total number of center entries were recorded. This test was filmed with a video camera due to the possible interaction of the mice with the experimenter. Elevated cross maze: the apparatus consists of two open arms (25 x 5 x 15 cm) and two closed arms (25 x 5 x 1 cm) elevated to a height of 50 cm above the ground. After thirty minutes of the i.p. treatment mice were individually placed in the center of the apparatus and left for 5 minutes. The total number of entries and time spent in open and closed arms were recorded. This test was filmed with a video camera due to the possible interaction of the mice with the experimenter. All experiments described were conducted in accordance with accepted principles of the guide for the care and use of laboratory animals 8. Toxicity assay: lethal concentration 50 (LC50) was determined following Meyer method (1982) modified by Molina and collaborators (2006). The following concentrations of the E. edulis extract were used: 25000, 22500, 20000, 17500, 15000 and 12500 μg/mL, and the control group was treated with vehicle. Artemia salina nauplii were used in this assay. The plate was incubated under dim light at 25°C for 24 hours; nauplii were observed under a stereomicroscope and they were considered dead if they stayed immobile for a lapse of 10 seconds. LC50 was estimated using Probit analysis, and it was compared to Clarkson´s toxicity index 9. Preliminary phytochemical screening: thin layer chromatography (TLC) was performed for the detection of alkaloids, flavonoids, anthraquinones, terpenes, saponins, and tannins following the methodology described by H. Wagner and S. Bladt 10. Statistical analysis: data was analyzed using One-way ANOVA followed by Tukey's posthoc test using R 3.4.3 64 bits’ version software. Toxicity assay was analyzed using linear regression with Finney Probit analysis. Erythrina edulis was collected in the province of Azuay in order to process the material to obtain the methanolic extract. After the procedures, the yield of the extraction was 9:1 (dry drug/ lyophilized). Pentobarbital-induced sleeping test was used at the beginning to evaluate sedation, obtaining the following results: the positive drug, diazepam, produced a decrease (p <0.001) in the latency time and a definite increase (p <0.001) in the sleeping time compared to the control group which validates the test. The administered doses of the extract presented no significant variation in the latency time. Doses of 250 and 500 mg/kg produced a decrease (p <0.01) in the sleeping time, which is the opposite response to the one expected (Figure 1). Figure 1. Latency and sleeping time of the methanolic extract of E. Edulis and diazepam compared with the control group. All data are expressed by mean ± SEM (n=6); *p<0.05, **p<0.01. One-way ANOVA and Tukey’s post hoc test were applied. Traction test was also performed to evaluate the potential sedative activity of Erythrina edulis, which was measured as the recovery time after 30, 60 and 90 minutes of the administration of the extract. This test has to do with muscular relaxation, which probably is not the mechanism of action of the extract because all doses at different times did not show an increase in the reincorporation time. E. edulis at doses of 125 and 250 mg/kg decreased (p <0.001 and 0.01) the recovery time at 30 minutes in comparison to the control group. Similar results were shown by E. edulis at doses 250 and 500 mg/kg at 60 minutes (p <0.01) (Figure. 2). No changes were observed at the third exposure at 90 minutes (data not shown). Figure 2. The recovery time of E. Edulis compared with the control group at 30 and 60 min after the extract administration. All data are expressed as mean ± SEM (n=6); *p<0.05, **p<0.01. One-way ANOVA and Tukey’s post hoc test were applied. The open field test is one of the most critical experiments used to value the emotionality in rodents. It exposes to rodents to an unknown and broad place. This test assesses some parameters. The most representative ones are shown. Treatments with E. edulis at doses of 125 and 500 mg/kg increased significantly (p <0.01, 0.001) the number of crossed lines compared with the control group, which is an indicator of the stimulation of neuromuscular system. The number of entries to the central square increased (p <0.001) by E. edulis at doses of 125, 250 and 500 mg/kg; results that suggests an exploratory behavior which is an indicative of low levels of anxiety (Figure 3). The number of assisted rearings was decreased by E. edulis treatment (p <0.01) (Figure 4). The total time spent in the center shows that neither E. edulis nor diazepam administrations induced changes. Figure 3. The number of crossed lines and entries in the central square. All data are expressed by mean ± SEM (n=6); *p<0.05, **p<0.01, ***p<0.001. One-way ANOVA and Tukey’s post hoc test were applied. Figure 4. The number of rearings. All data are expressed as mean ± SEM (n=6); *p<0.05, **p<0.01, ***p<0. One-way ANOVA and Tukey’s post hoc test were applied. The elevated cross maze was also performed. It evidenced that the number of entries to the open arms increased with the doses of 125 mg/kg (p <0.01), and 250 mg/kg (p <0.05). Also, the time permanence of mice in the open arms increased with 125 and 250 mg/kg (p <0.01) in the time of permanence in the open arms. It is important to mention that the protocol developed is excellent because diazepam produced an increase (p <0.01) in the activity within the open arms and produces a decrease (p <0.001) in the time of permanence in the closed arms (Figure 5). Figure 5. Number of entries into open arms and time spent in open and closed arms. All data are expressed as mean ± SEM (n=6); *p<0.05, **p<0.01, ***p<0. One-way ANOVA and Tukey’s post hoc test were applied. Toxicity assay: All data obtained from this test is shown in Table 1. Table 1. Toxicity assay in Artemia Salina nauplii. The LC50 obtained from the extract was 16571.78μg/mL calculated with a linear regression equation: y= 12,0x+(-45,70). This value corresponds to zero toxicity in Artemia salina according to the Clarkson toxicity index 9. Phytochemical analysis of the extract revealed the presence of flavonoids (Flavonols, flavones and phenolic carboxylic acids), anthrones, anthranols, terpenes (mono and sesquiterpenes), saponins and hydrolysable tannins. 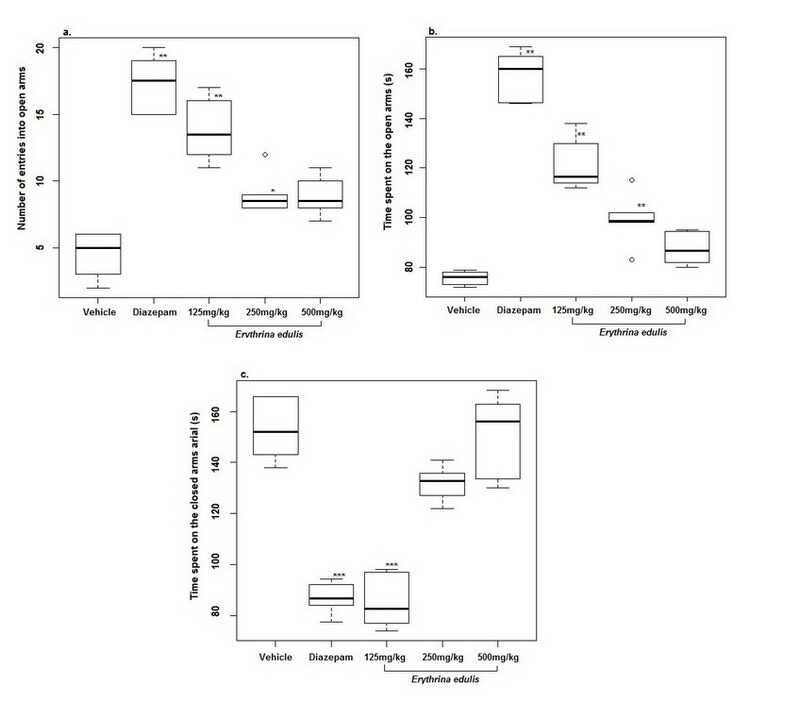 In the present study, the sedative and anxiolytic effect of the acute administration via intraperitoneal of the methanolic extract of Erythrina edulis in mice were studied. It is well known that the central nervous system (CNS) depressant drug in the pentobarbital-induced sleeping test causes a decrease in the latency time and an increase in the sleeping time. We observed that the extract of E. edulis produced the contrary effect. It is also important to mention that doses of 250 and 500 mg/kg decreased the sleeping time even lower than the control group. These results suggest that there could be a nervous system stimulation due to the extract which should be confirmed with another type of studies. Also, these can be attributed to other factors such as an interaction of antagonism between the extract and pentobarbital or induction of the cytochrome P450 produced by the extract stimulating the pentobarbital metabolism 11. On the other hand, the traction test was completed to assess muscle strength and neuromuscular function in rodents using the restoration reflex as a guide to determine the level of sedation. Mice that are exposed to a drug with a sedative effect do not have such a reflex or it takes them longer to reestablish throughout 3 expositions 12. The mice exposed to E.edulis methanolic extract showed a decrease in recovery time. During the first exposure mice treated with 125 and 250 mg/kg doses have a shorter recovery time. This behavior is repeated in the second exposure (60min) with the 250 and 500 mg/kg doses discarding the muscle relaxant effect of the extract. The reason for performing those two tests together was because the sedative effect of a substance is measured by its capacity to produce hypnosis, muscle relaxation or both. According to what was obtained in both pentobarbital-induced sleeping and horizontal bars, the extract produces an action opposite to hypnosis and muscle relaxation, which suggests a possible neuromuscular stimulation produced by the extract. The technique of open field (OF) is one of the most used ones to evaluate emotionality in mice. The exposure of mice to bright unknown spaces produces fear and anxiety responses in the animals changing their behavior and locomotive activity 13,14. The number of crossed lines measures locomotor activity, and it is used to measure the sedative activity in mice 15,16 roughly. Foyet and colleagues define it as horizontal movement. Foyet suggests that an increase in this parameter discards a sedative effect because an increase in the horizontal movement is an indicator of stimulation in the central nervous system. Another behavior analyzed in the OF is exploration. Thus, the number of entries to the central square is an indicator of exploratory behavior; therefore, of low levels of anxiety 13,16 17. Anxiety can also be measured with this parameter if we consider thigmotaxis behavior. Thigmotaxis refers to the influence that a solid object has on the behavior of the rodent. In this case, the walls of the apparatus provide a safe area inciting mice to stay close to them indicating high levels of anxiety. E. edulis presented essential results in the tests related to anxiety. OF showed an increment of the number of crossed lines by mice at doses of 125 and 500 mg/kg. The extract also increased the number of entries to the central square at doses of 125, 250 and 500 mg/kg. The number of assisted rearings is also affected by the extract producing a decrease with all doses. Ergo findings obtained in the OF test suggest a possible non-dose-dependant anxiolytic effect produced by the extract. Elevated cross maze proposes that the number of open arms entries and the time spent in them is higher in mice with less or no anxiety 19,21. As expected, diazepam produces an increase in open arms entries (p <0.001) when compared to the control group. All doses of E. edulis extract produced an increase in the number of entries into the open arms. The extract also increased permanence time in the open arms at doses of 125 and 250 mg/kg. These results corroborate what was reported by Ribeiro et al. who determined that two species of Erythrina exerted anxiolytic-like effects associated with generalized anxiety disorders 20. Probably the effect could be mediated by the alkaloids present in the extract what corresponds with the reports of erythrinian alkaloids from E. mulungo 21. In future studies, it would be interesting to have a complete phytochemical profile o E. edulis. All data exposed before leads to a state that the methanolic extract of Erythrina edulis has a potential anxiolytic effect being no sedative. These results give us the possibility to develop in the future an alternative treatment for anxiety without sedation as a side effect, contrary to the drugs used for this disease today and which could cause some problems in patients. We want to thank to the Cooperation Program VLIR-UOS/U.Cuenca for its academic support in the present work; and to the Medicnal Plant group of the Faculty of Chemistry of the University of Cuenca. Pino S, Prieto S, Pérez M, Molina J. Género Erythrina: Fuente de Metabolitos Secundarios con Actividad Biológica. Acta Farmacéutica Bonaerense. 2004; 23(2): p. 252-8. Rios M, Koziol MJ, Borgtoft Pedersen H, Granda G. Plantas Útiles del Ecuador: Aplicaciones, Retos y Perspectivas/Useful plants of Ecuador: Applications, challenges, and perspectives. Quito: Corporación Sociedad para la Investigación y Monitoreo de la Biodiversidad Ecuatoriana (SIMBIOE); 2007. Barrera N, Mejía M. Chachafruto, balú, sachaporoto, Erythrina edulis, Triana: Pasado, presente y futuro Colombia: Universidad Nacional de Colombia - UNAL; 1998. Johnston G, Hanrahan J, Chebib M, Duke R, Mewett K. Modulation of ionotropic GABA receptors by natural products of plant origin. Advances in Pharmacology. 2006; 54: p. 285-316. Edewor Kuponiyi T. Plant-Derived Compounds with Potential Sedative and Anxiolytic Activities. International Journal of Basic and Applied Science. 2013; 2(1): p. 63-78. Santos N, Viana G, Cunha W, Campos A, Da Costa J. The essential oil from Vanillosmopsis arborea Baker (Asteraceae) presents antinociceptive, anti‑inflammatory, and sedative effects. International Journal of Green Pharmacy. 2015;(9): p. 138-142. Deacon R. Measuring Motor Coordination in Mice. Journal of Visualized Experiments. 2013; e2609((75)). National Research council. Guide for the care and use of laboratory animals. Octava ed. Washington, D.C: National Academy of Sciences; 2011. Clarkson C, Maharaj VJ, Crouch NR, Grace OM, Pillay P, Matsabisa MG, et al. In vitro antiplasmodial activity of medicinal plants native to or naturalized in South Africa. Journal of Ethnopharmacology. 2004; 92: p. 177-191. Wagner H, Bladt S. Plant Drug Analysis A Thin Layer Chromatography Atlas Alemania: Springer; 1996. Goloubkovaa T, Hecklerb E, Ratesb S, Henriquesa J, Henriquesb A. Inhibition of cytochrome P450-dependent monooxygenases by an alkaloid fraction from Helietta apiculata markedly potentiate the hypnotic action of pentobarbital. Journal of Ethnopharmacology. 1998; 60(2): p. 141-148. Sanchez B. Tranquilizantes en Medicina España: Real Academia Nac. Medicina; 1962. Bailey KR, Crawley JN. Anxiety-Related Behaviors in Mice. In Buccafusco JJ. Methods of Behavior Analysis in Neuroscience. Boca Ratón, Florida: CRC Press/Taylor & Francis; 2009. Ajao MY, Akindele AJ. Anxiolytic and sedative properties of hydroethanolic extract of Telfairia occidentalis leaves in mice. Brazilian Journal of Pharmacognosy. 2013; 23(2): p. 301-309. Khatoon M, Khatun H, Islam E, Parvin S. Analgesic, antibacterial and central nervous system depressant activities of Albizia procera leaves. Asian Pacific Journal of Tropical Biomedicine. 2014; 4(4): p. 279-284. Foyet HS, Tsala DE, Bouba A, Hritcu L. Anxiolytic and Antidepressant-Like Effects of the Aqueous Extract of Alafia multiflora Stem Barks in Rodents. Advances in Pharmacological Sciences. 2012. Colin L, Burton S, & O'Keefe J. Rearing on Hind Legs, Environmental Novelty, and the Hippocampal Formation. Reviews in the Neurosciences. 2006; 17: p. 111-133. Seibenhener M, Wooten M. Use of the Open Field Maze to Measure Locomotor and Anxiety-like Behavior in Mice.. Journal of Visualized Experiments. 2015; 96. Walf A, Frye C. The use of the elevated plus maze as an essay of anxiety-related behavior in rodents. Nature Protocols. 2007; 2(2): p. 322–328. M.D. Ribeiro GMOSCPaMBV. Effect of Erythrina velutina and Erythrina mulungu in rats submitted to animal models of anxiety and depression. Brazilian Journal of Medical and Biological Research. 2006; 39(2): p. 263-270. Flausino O, de Ávila Santos L, Verli H, Pereira AM, da Silva Bolzani V, Nunes-de-Souza R. Anxiolytic Effects of Erythrinian Alkaloids from Erythrina mulungu. Journal of Natural Products. 2007; 70(1). Meyer BN, Ferrigni NR, Putnam JE, Jacobsen LB, Nichols DE, McLaughlin JL. Brine Shrimp: A convenient general bioassay for active plants constituents. Journal of Medicinal Plant Reasaerch. 1982; 45: p. 31-34. Molina G, Said-Fernández S. A modified microplate cytotoxicity assay with Brine Shrimp larvae (Artemia salina). Pharmacologyonline. 2006; 3: p. 633-638. ¹ Carrera de Bioquímica y Farmacia de la Universidad de Cuenca. ²Departamento de Biociencias de la Universidad de Cuenca, Grupo de Plantas Medicinales.